SayWhatNews: Hi Nicole, thanks for interviewing with SayWhatNews. In three words tell us who is Nicole Munoz? Nicole: Hi SWN! My pleasure! If I had to pick three words they would be: Active, Passionate and Adventurous. Nicole: I was born and raised in Vancouver, Canada. It is such a beautiful place to live; the trees and the mountains remind me everyday as to how lucky I am to live here. SayWhatNews: What’s your most favorite memory growing up in Vancouver? Nicole: Every year I would go either skiing or snowboarding with my family on one of our many mountains. I love speeding down a hill, using a garbage bag as a toboggan or starting a snowball fight with one of my parents. SayWhatNews: Do you have any brothers or sisters? Nicole: Yes, I have two half-sisters, Britta and Sophia Muñoz. They are both older than me but we get along extremely well. Not only are they family but also they are my closest friends. I look up to them and I love them both very much. SayWhatNews: Your career in the entertainment business started at the tender age of 4. How did you get started in the business? Nicole: It was all very spontaneous. My mom was persuaded by an acquaintance to go see her agent and start sending me to auditions. I was a very outgoing child, never shy and I listened well. Turns out that was a winning combination because I ended up booking the first audition I had ever been to. It was for a laundry detergent commercial. I ended up continuing to audition and eventually acting became a huge part of my life. SayWhatNews: When did you realize that you wanted to be an actress and what inspired you to take that path? Nicole: I have been acting my whole life and so there was never a turning point where I thought “oh! This is what I want to do!” I have always wanted to do this and I have always strived for acting to be my career path and I always will. My love for the craft is what inspires me to continue this career path, it is an enormous part of my life and I am dedicated to keeping it that way. SayWhatNews: Nicole you have appeared in many films such as “Fantastic 4”, “The Last Mimzy” and the comedy “Tooth Fairy”. How do you prepare for a role? Nicole: I tend to do a lot of research on the characters I wish to portray as well as dissect the script. There are a lot of hidden treasures and hints within a movie script that can only be found if you do your research. SayWhatNews: You have also guest starred in several Sci-fi TV shows like the CW’s Supernatural and Syfy’s Sanctuary. What was the most changeling role you had to play and which was your favorite? Nicole: The most challenging role I have had to do is my role in the not yet released TV movie “Baby Sellers”. There were quite a few challenges I really enjoyed facing while filming this project. I am very excited for the public to view it. My favorite role to play was “Hermilla” in the Netflix original series, “Hemlock Grove”. Being able to portray a werewolf was an intense and exciting experience. From prosthetics to pyrotechnics to a great fight scene, this was by-far one of my top characters to play. SayWhatNews: Nicole you are more than just an actress, you are an experienced dancer of Jazz, Hip-Hop, ballet and contemporary which helped you land a lead role in the film, “Centre Stage: Turn it Up”. How amazing was it for you to use your acting skills and dance skills together in a movie? Nicole: It was absolutely fantastic. I had so much fun on that set. The great thing about dance movies is the rehearsal that happens before hand. It is a lot of work and long hours, but being able to see the final product on film is extremely rewarding, not to mention it is a blast doing it! SayWhatNews: Would you consider doing any more films surrounded around dance? Nicole: I would love to work on a project that incorporates dancing and acting. Dancing is my second love and it would be so much fun to be able to do both in a film. It is something I have always wanted to do and I hope to one day fulfill that dream of mine. 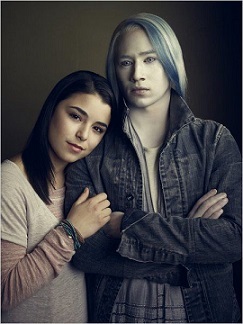 SayWhatNews: Nicole I have to ask you about the ground-breaking Syfy series Defiance which premiered in April. Your character Christie McCawley has a relationship with an Alien which is kind of like the Romeo & Juliet story where your families are enemies. Tell us more about your character? Nicole: Christie is a very strong and family oriented girl. Though she is at the age where she wants to be able to spread her wings and discover things on her own. She falls in love with a Castithan, Alak Tarr, his culture and traditions really intrigue her but they repulse her father. Christies’ wish to marry Alak causes a lot of friction between the families and between her and her father. She is torn between two loves and is trying her best to mend all wounds. SayWhatNews: The show is really good and addictive. How did you learn about the part? Nicole: I auditioned for the role of Christie in Vancouver over tape. When I read the script I was very excited to audition, I knew the show was going to be successful based on the script alone. I also fell in love with the character “Christie”. She is an admirable girl, very strong and very brave. SayWhatNews: Can you give us any sneak peeks as to what’s going to happen with your “Defiance” character Christie Crawley? Nicole: We have an up coming episode on Monday the 24th that involves Alak and Christies wedding. 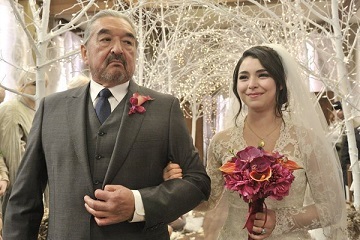 It causes a lot of tension between the two families that even threatens to cancel the wedding. A lot of drama is stirred up resulting in consequences. Tune in Mondays to find out how it all unfolds. SayWhatNews: Yes, I look forward to watching because it’s getting really good as the season finale grows near. Nicole you earlier mentioned the TV series for Netflix, “Hemlock Grove” and your character Hermila. So what’s “Hemlock Grove” about? Nicole: “A teenage girl has been murdered, which ignites a hunt for the killer. But in a town where everyone hides a secret, will they find the monster among them?” That is how the show has been described with the media. I think it is an incredible show with lots of suspense, a great plot line and incredible actors. Bill Skarsgard and Landon Liboiron do a fantastic job. While I was on set I had the chance to chat with them both, they are incredibly down to earth and very kind. SayWhatNews: Besides two new shows which both premiered in April, you have a reoccurring role as Trina in the comedy pilot, “Rita’ for Bravo and just wrapped “MOW Scarecrow” for Syfy which will premiere sometime in 2013. Wow you are so busy, how do you keep things / projects organized? Nicole: I filmed those roles one after the other and so I had time to really focus on each individual project and give it my full attention. If there is anything I have learnt it would be that preparation is key, if you want things to go as smoothly as possible. SayWhatNews: Nicole, I hear you are taking kickboxing lessons so you can out for a martial arts film. What inspired you to want to do this? Nicole: I love to watch action films especially when the fighting scenes are well choreographed. I one day hope to be in a movie like Salt, Batman, or The Matrix and so I figured why not start preparing a little early?! Also, kickboxing is a great way to relieve stress and stay fit. It teaches discipline, strengthens my body and I have a lot of fun doing it. SayWhatNews: With such a busy schedule how do find time to relax? Nicole: No matter how busy I get there is always time to relax! I either take a break mid-day and treat myself to a fun lunch or stay up a little later at night and paint my nails. There is always time to squeeze a little “me-time” in. But I never feel a strong need to relax because I am having so much fun being busy! I am doing what I love to do and if it is keeping me busy, I am not one to complain! Nicole: I like to read plays, walk around downtown Vancouver, visit community gardens, go to the park with my dog or just relax in the backyard with my iPod and a snack. SayWhatNews: If you had front row tickets to a concert who would be on stage? Nicole: Justin Timberlake. I just have this feeling that he would be incredible to watch live. 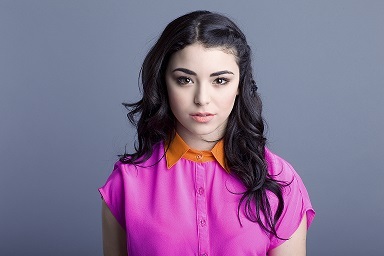 SayWhatNews: With over 40 film and TV credits, what’s next in the future for Nicole Munoz? Nicole: I just finished filming a movie called “Baby Sellers” for the Lifetime channel. It is a great movie that brings light to a very dark subject. I had the pleasure to work with Nick Willing, a great director, as well as a fantastic cast including Kristie Alley and Jenifer Finnigan.